These electric RC boats have been designed with the beginner in mind, but can also be fun as quick project for more accomplished builders. Construction is mostly balsa, basswood and card stock for simplicity. Plans for easy electric RC boats are not as common as I would have hoped. To fill the need I decided to make a crack at designing one. I've had a lot of folks contact me asking for plans and books suitable for a beginner to learn how to build a model boat without a kit. Unfortunately, there isn't a single website or book that you can pick up and instantly be up and running - at least not to my knowledge. Well, here is my attempt at filling that void. The goal is to make plans available for several versions with a common hull. First out is a cabin cruiser for it's simplicity. Other versions are on the drawing table, so to speak, and will be announced here at a later date. The goal for this design is to appeal to beginners and for more accomplished builders who wants a boat they can build relatively quickly and with little effort. A lot of design features for the hull has been borrowed from the PT-109 I designed earlier. The hull is built up on a "chine shelf" as a basis - a method mentioned as more or less a footnote in Vic Smeed's "Boat Modelling" and one I've never seen used elsewhere. One nice benefit to the method is that the strength of the structure is built up gradually without introducing stress from bent stringers an the like. This way it is a lot easier to build a straight and true hull off the bat. Something I believe beginners will appreciate. I also chose to use balsa and card stock as primary construction materials. There is occasional basswood and finishing materials, but the main goal has been to use materials that don't require a wood shop or expensive woodworking tools. Another design challenge was to keep the boat's proportions within an 11x17 (or A3) sheet, but still have buoyancy to carry batteries, a brushed motor and the RC controls. While the final "tub" test is still in the future, it seems the weight goal is within reach. With a finished weight of 1lb 4oz (560g) and the advent of NiMH AA batteries capable of 2300mAh, I think there will be plenty of run-time. With little time or money invested in a model I find it less stressful and more relaxing to build the boat. In addition, I have big ambitions for this design. Once the prototype of this electric RC boat is finished, I have plans to develop superstructures that will transform the boat into other types and purposes. To give you an idea, I've been thinking about patrol boats, coast guard picket boats, pilot boats, RAF type crash tenders, Maine lobster boats etc. The way the boat is designed, there is really no limitation to what can be done. 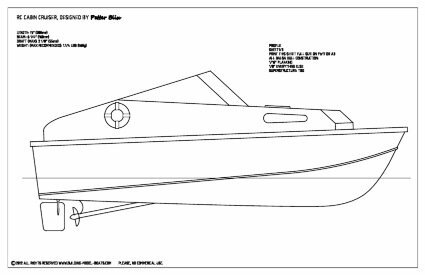 Find out more about the RC boat plans currently available to build these boats or learn more about how to build these RC model boats.